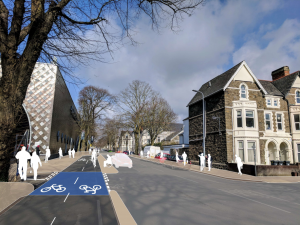 Cardiff Council are starting work on their Cycle Superhighway Network and they want to know what we think of their plans for the first part of the network. That very first bit is St Andrew’s Crescent to Senghennydd Road​ and will form part of Cycle Superhighway One. Our next meeting will be on Wednesday April 25th in RideMyBike Cafe, 26 Park Place, Cardiff CF10 3BA at 6.00pm. Gail Bodley Scott, the council’s cycling officer, will be in the cafe with all the plans from 4.00pm so that people can have a good look at the proposed route and ask her any questions they may have. She’ll also be with us for the first half of our meeting when we can have a general discussion on the plans. The Cycle Superhighways are a really exciting development for our city and it’s vital that we get them right, so we really need all our supporters to check out the plans and make their views known. If you can’t get to the meeting you can still view the plans and make comments online. The outline map of all the superhighways and the consultation pack and response form for St Andrew’s Crescent to Senghennydd Road​ can be found here: https://www.cardiff.gov.uk/ENG/resident/Parking-roads-and-travel/travel/cycle-super-highways/Pages/default.aspx . The consultation is open until 11 May 2018. I am going to have to try and get to this event because I am horrified by these pictures. I hope to goodness that no money gets spent on them. I am a lifelong cyclist who confidently rides in traffic; lucky me! But I would not be brave enough to take my chances cycling in the wrong side of the road towards traffic in the hope that no car user will ever cross the painted line protecting me; no way! All this will do is give motorists another reason to be cross with me for behaving like a legitimate road user. Looks to me like this plan will lead to a fatality within months. Hi Chris. These plans are for a fully kerb-protected cycleway, not a painted line. This is similar to the ones in London and on the continent, where the safety record is excellent. The road markings will also make it clear that the cycleway is separate to motors. There looks to be a big curb upstand on the car side of the lane with gaps. Just needs reflectors/reflector posts on. This arrangement is common across world. Needs a better graphic to be fair. Designer more worried about street picture than actual cycle lane detail. There are already cycle lanes the entire length of Senghenydd Road. It is also a quiet road for traffic even during peak times. The money would be better spent somewhere where there is a problem for cyclists such as busy roads, junctions or roundabouts. Cardiff Council should make the most of it’s limited cycling budget, not waste it on things that aren’t needed. Senghenydd Road is very quiet, it does not need a segregated lane. 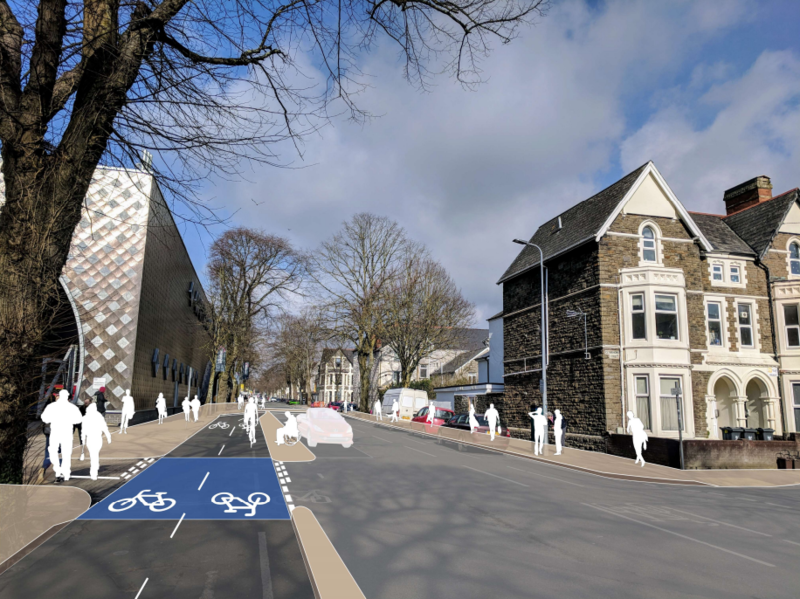 Penarth Road, Newport Road, Northern Ave, Cowbridge Rd West should be priorities, with segregated lanes on both sides down their entire length.